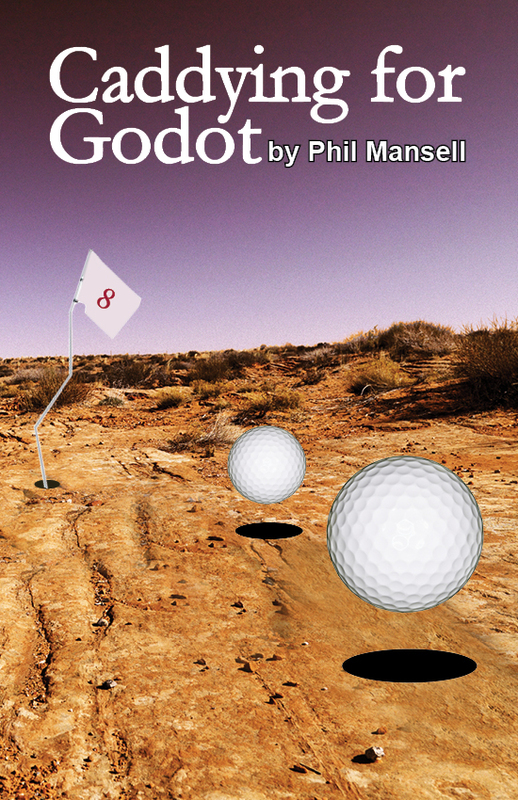 My latest play to be published by Silvermoon, ‘Caddying for Godot’, was created for a play-writing competition organised by Newport Playgoers Society to celebrate the Ryder Cup being held in Newport. The theme, naturally, was golf. I was keen to enter – play-writing competitions offering a chance for a play to be produced always spur me to write. The only problem with this particular competition was that I knew little or nothing about golf. 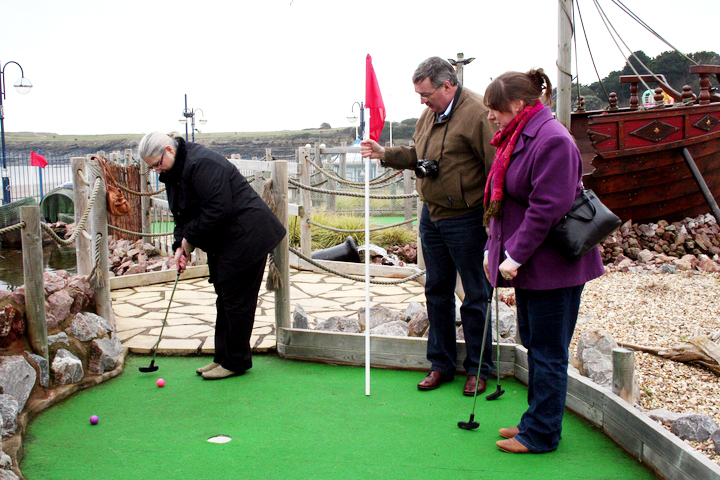 With the exception, that is, of crazy golf which we play whenever we can with our good friends Rog and Adrienne. So the first play I wrote for the competition used this setting. ‘Bunkered’ was about the trials and tribulations facing the owner of a run-down crazy golf course who is losing customers to a hi-tech rival at the other end of the beach. This play went on to be selected to be one of the winners and was performed at the 400-seat Dolman Theatre. Entries for the golf competition were submitted anonymously so that the judges had no idea who wrote them – which meant I could enter as many times as I wanted under different pseudonyms. So I decided to have another go. Next I came up with ‘The Missing Links’ set in a golf resort in Spain. 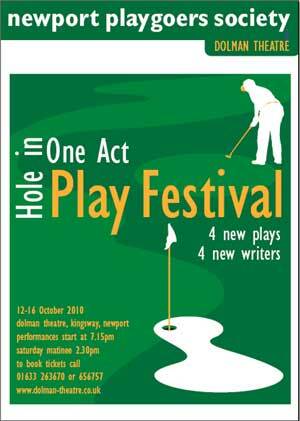 I had the writing bug good and proper now so I set about creating another play on the golf theme. For some reason, Samuel Beckett’s classic ‘Waiting for Godot’ popped into my head. (To my shame) I have never seen this theatrical masterpiece on stage but remembered reading it when I was a student at film school. My bedsit in Streatham had no television so entertainment came in the form of books. I was a voracious reader and vividly remember reading ‘Waiting for Godot’ in Lambeth Library where it was always warm – and saved me having to put coins into my bedsit’s electricity meter which required constant feeding. The play left a deep impression on me, and after refreshing my memory of it, I thought it would be a novel idea to pay homage to this classic by emulating Beckett’s style but in the unlikely setting of a golf course. Obviously a typical lush green course was out of the question, so I placed the action on a barren post-apocalyptic wasteland with a single, twisted flag marking the eighth hole. Here, two caddies converse as they await the return of their golfers and attempt to keep warm in the face of a bitterly cold wind which howls around them. 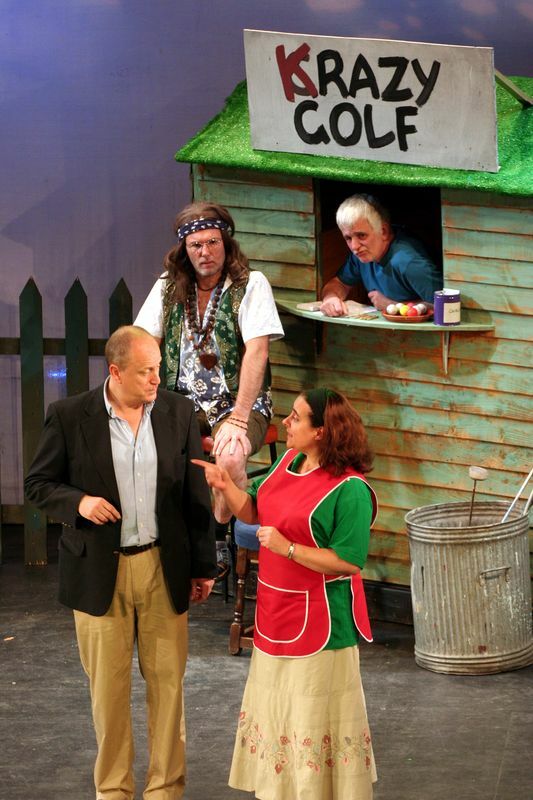 Originally, the play was called ‘Waiting for Gobbo’ as this is how one caddy, Beta, mistakenly refers to one of the missing golfers. As in Beckett’s play they are happened upon by two strangers, but instead of Pozzo and Lucky we have Cameo, a leading light of the golf club, and her put-upon caddy Dim who is made to recite a poem about drinking with ghosts in “a pub too perfect to exist” – another reference to my student days in Streatham. Of the three plays I entered for the competition, this is the one I enjoyed writing the most. I have always been fascinated by the surreal and one of the first plays I wrote back in those heady Lambeth days, ‘The Spangler Donaghue Memorial Teabreak’, was about workers in a Christmas cracker factory who find themselves trapped in a never-ending teabreak. Beckett’s characters are similarly trapped in time, as are my two caddies, although for them there is a faint hope that their golfers will return as they have left their golf balls only inches from the hole. As Beta says, “I could knock them in with a second-hand umbrella. Or my granny’s walking stick”. ‘Caddying for Godot’ was not one of the winners of the play-writing competition but I remember chatting with one of the judges after the winners were announced and telling him which plays I had submitted. He said he thought ‘Caddying for Godot’ was the best play that had been entered, which cheered me up no end as I thought in many ways it was a more ambitious play than ‘Bunkered’. I have always wanted to stage it in the Dolman Studio Theatre – but, alas, have never found the time. So here it is now, finally seeing the light of day and published by Silvermoon with a cover which I designed to capture the dreamlike quality of the play. Hopefully, some dramatic society seeking something a little different will stage it. If so, I’ll be in the audience, watching this homage to a great playwright brought to life. 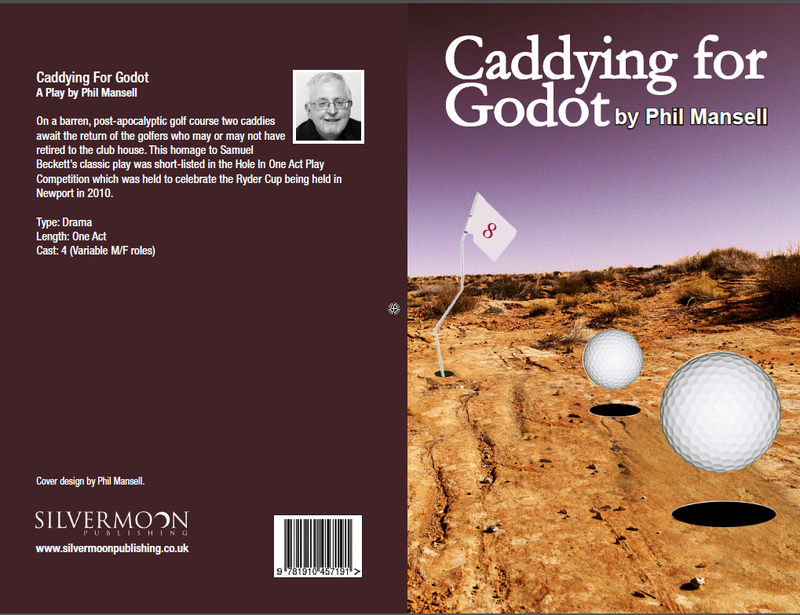 ‘Caddying for Godot’ is available on Amazon. This entry was posted in Uncategorized and tagged amateur theatre, Amazon, amdram, Award-winner, Barry Island, Bunkered, Bunkered by Phil Mansell, Caddying for Godot, competition, crazy golf, Dolman Theatre, drama, golf, Lambeth, new writing, Newport Playgoers, Phil Mansell, playwright, Poor Yorick by Phil Mansell, post-apocalyptic, Ryder Cup, Samuel Beckett, script, Scrivener, Silvermoon Publishing, stage, stage play, Streatham, student, Studio theatre, surreal, Waiting for Godot, wasteland, writing and re-writing. Bookmark the permalink.